As we head into the new year, state legislatures across the country will soon convene for their legislative sessions. With the exception of four states that are not in session in 2018 – Texas, South Dakota, Montana and Nevada – legislatures will resume starting in January through the beginning of April. (To see a full list of expected start dates by state, please see our 2018 state legislative calendar here). 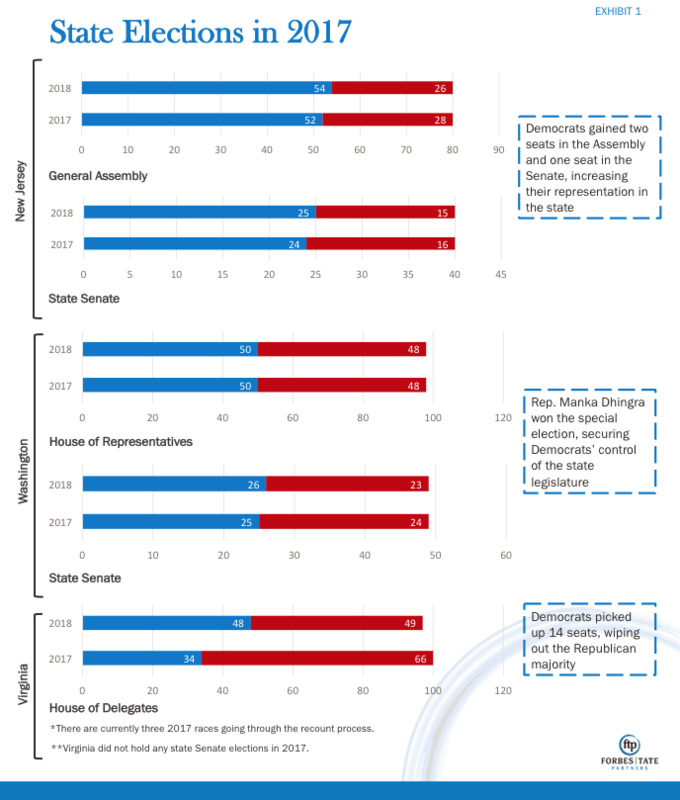 While recent elections in New Jersey, Virginia, and Washington have resulted in gains for Democrats (Exhibit 1), much of the legislative activity in 2018 will be under the lens of next year’s midterm elections as 36 governors and the vast majority of state legislators answer to voters in November. Add in any potential political fallout from Congress’ tax reform legislation, plus tough budgetary decisions in the face of less generated revenue, and elections are sure to impact legislative activities that influence local communities, from health care to education and more. Bottom line: 2018 is likely to be another pivotal year in the states. In fiscal 2018, state general fund spending is projected to grow 2.3%, the lowest spending increase since fiscal 2010. According to the National Association of State Budget Officers, this rate is a result of the cautious budgets enacted for 2018. Fortunately, states will also continue to strengthen their reserves despite slow revenue growth. Half of all states have projected increases in rainy day fund balances in fiscal 2018, which might come under pressure as states, counties, and cities respond to changes in the deduction of state and local tax. All 41 states that have an income tax linked to the federal code will feel the effects of federal tax reform. Most impactful would be the reduction of state and local tax deduction. 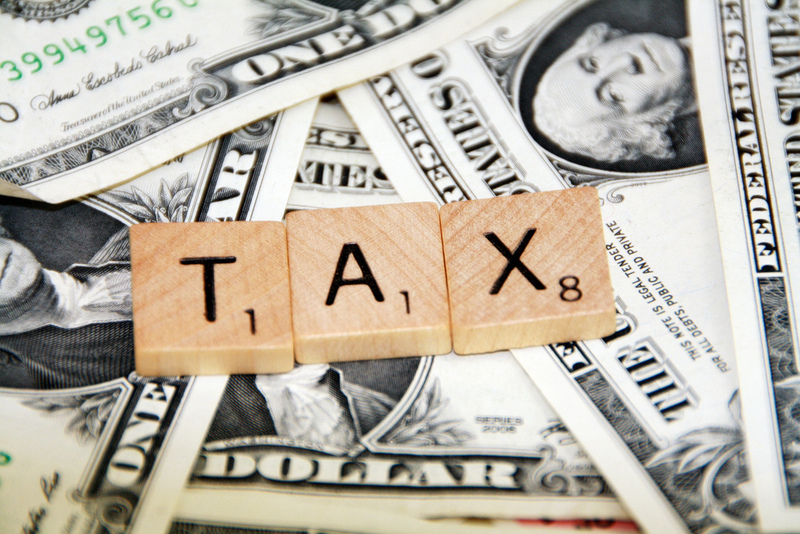 New York, California, and other high-tax states would be hard hit by the limitation of such deduction. Meanwhile, Congress has repealed the ACA’s individual mandate in order to finance tax reform legislation. In California, Maryland, and the District of Columbia, there are already discussions happening on how states can set their own mandates to purchase health coverage. States will also soon need money to pay for the thousands of children in their state who rely on the Children’s Health Insurance Program (CHIP) for medical services. Although this program expired at the end of September, Congress has yet to secure a new funding source. Alabama has become the first state to freeze enrollment in CHIP due to lack of funding, and at least six states have predicted they will run out of money by early January if CHIP isn’t reauthorized. With midterm elections approaching, some candidates will be sure to incorporate broader coverage and lower premiums into their platforms as states continue to grapple with the future of Medicaid expansion. A national health expenditure report shows that national health spending has outpaced economic growth for the third consecutive year. Combatting the opioid crisis will continue to be a priority in 2018. In particular, lawmakers in Colorado have already prepared a handful of bills to address opioid addiction treatment and prevention. In Indiana, Governor Eric Holcomb has pushed lawmakers in his state to lift the cap on clinics that offer medication-based treatment for addiction. In Maine, a special legislative taskforce is urging lawmakers to tackle five opioid bills carried over from the last session, including one bill that evaluates insurance coverage for addiction treatment and recovery alternative therapies. While state policymakers across the country have already mandated anti-opioid initiatives – such as increased use of prescription drug monitoring programs, continued education, and increased access to medication-assisted treatment – we can expect more bills in 2018 targeted at holding insurers accountable. In a time where many states have difficulty funding their school systems, federal policy changes may present further challenges. This week, congressional Republicans introduced the PROSPER Act, a rewrite of the Higher Education Act intended to streamline the student aid system and overhaul Obama-era regulations. Critics of the bill note its potential to limit state efforts to oversee schools and loan servicers. States may lose even more control of their education budgets as a result of federal tax reform. That same state and local tax deduction has the potential to increase the burden on individuals, leaving states and local school boards scrambling to find resources that are currently paid for by tax revenue. These issues have led many states to prioritize legislative solutions to financing public schools, their funding models, and whether or not to allow public funding for schools of each family’s choice. This is the fourth of a multi-series blog on nation-wide trends. See parts one here, two here, and three here.